Discussion in 'Approved Proposals / Updates + News' started by AlejandroE, May 24, 2018. CLARIFICATION: We won't ask for more funds until we reach our main goal: 2000 merchants affiliated on www.discoverdash.com. Please keep supporting us for these first 3 months. We will reach our goal, that's for sure. 1) (May 1st) New logo! Following the Dash new logo, we also did the same. We hope you like it. 3) (May 4-8th) Important meetings and advances: Grupo Paramo (Dutyfree stores at the airports and several other stores, 700 employees + 50 stores), Avila Burger (Burger franchise. 10 stores), Burger Shack (Burger franchise. 6 stores), Comiccon event (Event with Comics theme. 180 merchants). All of the companies are interested in accepting Dash, for June they all will be accepting Dash. 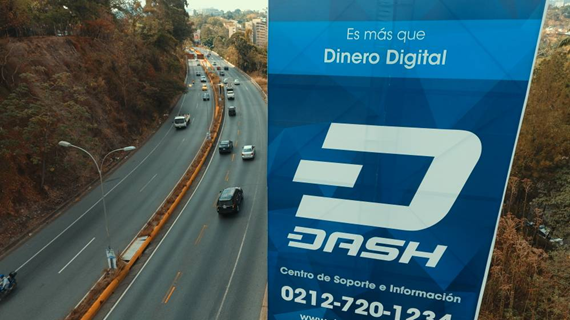 4) (May 9th) Dash billboards: in alliance with Dash Help we set up te first 2 big Dash billboards at the biggest highway of Venezuela (Francisco Fajardo and Prados del Este). See pics and videos here: video, picture. 5) (May 10th) Big Integration! - tlotengo.com - 150 merchants: we made that tlotengo.com (discount coupon platform like Groupon) accepted Dash as a payment method in its website. This is the biggest merchant we have so far, counting with +150 merchants. People will now be able to buy coupons in Dash. 6) (May 12th) Dash Caracas Conference: We were at the 8th Dash Caracas conference providing information to people and merchants about Dash. 7) (May 16th) Dash POS Integration! We set up an important alliance with a Dash POS provider. The company is QR.CR. The system works perfectly with Bolivar/Dash rate. (See pic below). This will help us to reach many more merchants because it makes the transactions much easier. We are already promoting this POS to all retail merchants. 8) (May 18th) Dash Merchant at Simon Bolivar University - Dash University (May 18th): we were at the Simon Bolivar University teaching to the representants of all carreers (14 in total) how to accept Dash in their kiosks (each carreer has a kiosk where students can buy coffee, sandwiches, groceries, etc). In this we converted this university in the first one in being Dash friendly. 9) (May 21th) Expansion of the team: After 3 weeks we are expanding the team up to 12 sellers + 2 supervisors. 11)+200 merchants at discoverdash.com! We are pleased to announce you that we have reached +200 venezuelan merchants on discoverdash.com. We will keep working to afiliate many more! Next stop: 300 merchants. 12) Budget report: We will report the financial status of the budget on June 1st. What a good job, we hope you can keep adding merchants and count on AgroCogntivite for more! Dear MNO's and Dash Community, we are pleased to share you the first video of our weekly report in order to show you the progress with our merchant adopion program in Venezuela. This is June 2018, Week #1. We are making a good progress and we wil make history, so we hope you enjoy it! Hello Dash Community, we are very excited to announce you that Venezuela already passed the US in number of merchants affiliated in discoverdash.com! We are working very hard to affiliate as many merchants we can and we are getting very good results. Please keep your eyes on us, we are making history. Thank you very much for your trust and please keep supporting us! Dear MNO's and Dash community, we are pleased to share you the video of our weekly report in order to show you the progress with our merchant adopion program in Venezuela. This is June 2018, Week #2. We are nearing 400 merchants already accepting Dash in Venezuela, so excited to keep working on massification! Do you have some data on how often people actually buy something with Dash it any of these merchants? Hello TheSingleton, thanks for your question. We are collecting this data from all the merchants by calling and visiting them. For example, the "famous" lady of the kiosk is receiving at least 1-2 transactions per day (and this is just a tiny kiosk). Besides, with the POS system from QR.CR it is possible to see the exact number of transactions the merchants (who use it) are receiving. Once we have a more solid data we will share it in this thread. Thanks again for your question. Dear MNO's and Dash community, this is our weekly report of our merchant adopion program in Venezuela. Also, something I would find interesting to know are there Merchants adding Dash without your direct involvement and if so how many? Yes, there are merchants being added at DiscoverDash.com without our direct involvement. For example, the Dash Maracay team has added some merchants (they added around 20 merchants). It is difficult to see merchants adding theirselves but I know there are a few ones. Anyways, we (Dash Merchant) have around 70% of the merchants added at the site. Dear Dash Community, we are glad to share with you an article that Cryptovest.com did about the mass adoption of Dash in Venezuela. Thanks to the effort of Dash Merchant Venezuela, Dash Help and the other Dash projects we are making a lot of noise around the globe! The new proposal of our closest allies: Dash Help! Dash Help is the first support center of a crypto in the world, and it is exclusve for Dash (calls, livechat and ticket support). We provide support to Venezuela, Colombia, Mexico, Argentina and Spain, and we will expand the service to the US & Brazil + videos tutorial of "How to use the Dash Wallet" + Marketing work + collaborations with the Dash Core Team. WE GOT 1000 VENEZUELAN MERCHANTS! Dear Dash community, we are so happy to announce that thanks to our efforts and the rest of the projects in Venezuela, we already have 1000 Venezuelan merchants affiliated on DiscoverDash.com! This represents almost 40% of the total merchants worldwide and Dash Merchant Venezuela has affiliated up to 85% of all Venezuelan merchants. Thanks so much for your support! We won't stop working! Dear Dash community, in the following video we show how people can pay for a sandwich in Subway with DASH. Location: CCCT, Caracas, Venezuela. To date Dash Merchant Venezuela has affiliated 14 Subway restaurants in Caracas. Dear Dash community, in the following video we show how people can pay for a pizza in Papa John's with DASH. Location: Los Palos Grandes, Caracas, Venezuela. To date Dash Merchant Venezuela has affiliated 6 Papa John's restaurants in Caracas. Dear Dash Community, in the following video we show how people can pay for an ice cream with Dash in EFE (the most important ice cream brand in Venezuela). In this video we showcase the incredible new feature from Dash Text, the purchase command "Compra", which allows people to make quick payments to merchants with just a simple code, without needing to type an amount to be payed or a recipient, its all done seamlessly, users get a confirmation message with the details of the purchase so they can review before actually paying, it works great! Dear Dash Community, last Saturday our Dash Merchant agents were at City Market mall in Caracas (one of the biggest tech malls in Venezuela), supporting customers with their first Krip phone, getting their Dash and ready to spend. We also spoke with one of the biggest distributors of Krip in Venezuela (Datacel) and they told us that they have sold around 7000 phones so far. Dear Dash Community, last Saturday we were in the City Market mall supporting customers with their first Krip phone, get their Dash and ready to spend.